That’s kind of a mouth full, isn’t it? If you haven’t noticed by now, the names I give things aren’t very creative. They are more of categorical labels. I thought I was brilliant when I named the grape soda dress. It’s purple, get it? Brilliant! I may practice naming things in the future but for now, I present the “faux ruffle button placket tutorial” for your viewing pleasure. To make the placket front cut a strip of fabric 4″ by 13″. Sew it into a tube and press it flat. Don’t worry about the top and bottom edges, we’ll fold those over later. Once they are pressed in half, sew 3 rows of baste stitching 1/4″ apart to gather it up. Pull the ends of the basting to make ruffles. Sewing in three rows will make it easy to get even ruffles. Plus if you break a thread, not all is lost. Spread out your ruffle along the edge of the placket on the back. Fold over the bottom of the ruffle to form an L shape. That way it will finish nicely along the edge. Fold over the top ruffle and placket piece at the same time. Fold it over about 1/2″ and pin in place. The remaining ruffle will catch in your stitching and you can trim it off later. By doing this, you won’t have any raw edges showing so nothing will fray. My fabric is very prone to fraying so this is a must. This is what the back bottom will look like. And the front. It’s a mess right now, but don’t worry! Stitch along the edge of the placket at about 1/8″ sewing the ruffle on. Remove any baste stitching that is still showing. Your pretty placket will look like this: The ruffle splays out at the top and tucks in at the bottom. Cute, huh? Sew on some buttons. 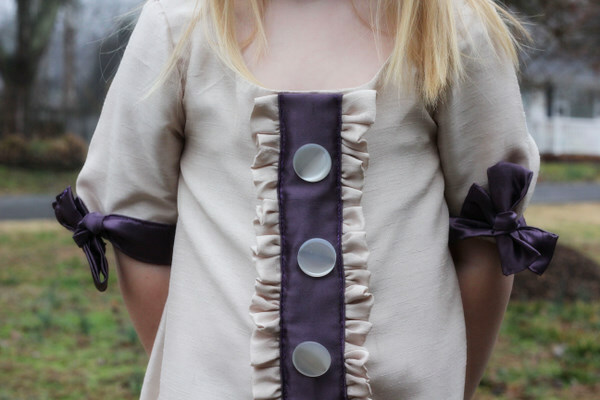 You can also do this after you sew the placket to the dress. If your buttons are large, it might be easier to wait. Now the placket is all ready to apply to the rest of your dress. Sleeves here. Full dress here.